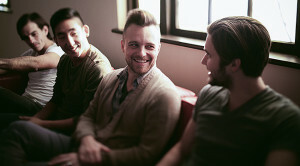 Named after two characters in Dostoevsky’s The Brothers Karamazov, the folk-rock group Ivan and Alyosha had a minor hit two years ago when “Easy to Love” picked up some radio airplay. The group has just issued its full-length debut, All the Times We Had, and singer-guitarist Tim Wilson phoned in from his Seattle home to talk about the band’s approach on the album. Here’s what he had to say. Talk about what you were doing musically before the band came together in 2007 and what made you think you wanted to go in a new direction. Well, I was in a band with some friends of mine. They were good guys. I didn’t start the band. I came into it late and sang and did some writing for them. It was more experimental and a little bit jammy, which was cool. They were into a lot of different stuff than what I was into; the stuff I was excited about was writing pop songs. That’s what I started doing. What I started writing wasn’t consciously different. It was just a product of what I was listening to and what I was always listening to, which was popular music in general. To what extent do you feel connected to the Seattle music scene? We are a lot more rooted in the local scene now than we ever have been. It gets harder when you get on the road to be constantly in tune with what is going on here. I’m thankful people don’t forget about us when we come back and do shows. Just being around for as long as we have, naturally those relationships get built. I feel proud to come from Seattle and definitely a part of what is going on in town. I think it’s part of a great tradition, especially in Seattle, there has been a lot of great music and it’s awesome to be a part of that. There’s an appetite for the folk-rock you play? Yeah. Maybe even more so now. We’ve never been the indie “it-band” in Seattle. It’s taken some time for people to warm up to us. [Seattle station] KEXP is playing the full-length and that’s awesome, but that’s the first spins they’ve given us. Maybe they were just waiting for us to do something cool. I think we’re maybe a bit more pop music-minded than most vibe-y indie bands, which is what might be really popular with Seattle fans. That’s not what Seattle is producing, though. That has defied genre recently. Macklemore is huge and Pickwick and the Head and the Heart. We got looped into the whole Fleet Foxes/Head and the Heart thing, but at the end of the day all we want to be is a rock band. Why do you think you’re so drawn to the folk-rock sound that was popular decades ago? I guess I think what I love is the bigness of it all. I never got into anything super underground. One of the first serious shows I went to was the U2 Pop Mart show at the Kingdome here in Seattle. I was drawn to the spectacle. I loved the bigger boys and girls that are doing it: the U2s and the Frank Sinatras and the Elvises. I was drawn to those big personalities and talents. I think in junior high, me and my brothers got into the Beatles anthology and Jimi Hendrix and Zeppelin. I discovered Michael Jackson early on before kindergarten. I remember the moment I first heard a Michael Jackson song. I’ve always been drawn to the big rock ’n’ roll sound and personalities. What was it like making your debut, 2009’s EP The Verse, The Chorus? We called that an EP but I think it’s 7 songs and goes over the time for an EP. Technically, it’s an LP. We joked about that recently. I don’t write that much to be honest and what I do usually ends up on a record. Early on, that was the case. I didn’t write 100 songs and keep 7 of them. I wrote 10 songs and kept 7 of them. That was basically the record that Ryan [Carbary] and I made together. It was our first record and a little bit of a trial by fire. We had some songs and we spent a couple of weeks in Los Angeles with our friend who helped produce it. We just needed a record. We were thankful that were a couple of songs that people gravitated to, especially “Easy to Love.” That took the longest of our records. We don’t get to spend much time in the studio lately because we’re on the road so much. …it’s a record. It’s a collection of songs. It’s not one single and nine turds. I feel like there’s always a constant conversation about what is the next single and what will be the breakout song. I feel like it could be any one of those songs, to be honest. Talk about recording All the Times We Had. You wanted it to sound like a live album, is that right? Yeah, we wanted to. I think we got close. We kept on hearing this backhanded compliment from people that they love the record but that we were so much better live. Naturally, there will be more energy in the live show. We tried to capture that in the recordings. I think we got closer than the previous albums. I think we’ll keep on getting closer. I’m proud of the record and we did track a lot of it live in a room together. Amps would be in an isolation room and bass guitar would be behind a wall. I think the performances and actually playing live in the studio certainly lent it to have more of that vibe. The response has been really cool, too. The other point is that it’s a record. It’s a collection of songs. It’s not one single and nine turds. I feel like there’s always a constant conversation about what is the next single and what will be the breakout song. I feel like it could be any one of those songs, to be honest. USA Today describes the songs on the album as “sheer joy, from their melodic surface to deep inside their lyrical core.” There is something really joyful about the music. Where does that come from? I think the songs and the playing is an extension of who were are as people and the friendships within the band and the fact that we do enjoy playing songs together. Some of the lyrical content is maybe not so joyful. There are a lot of questions and trying to deal with some tougher issues. I think that joy comes from a real sense of purpose. And music universally is an inspiring thing. I was inspired when I was a kid and now I try to recreate that. It’s also a spiritual thing and takes people to a different place and is proof that there’s more to life and it’s not just one big accident. Music is one of the better things about life. And yet, there’s something pensive and even sad about “The Fold.” To whom is that song addressed? I feel like that song was written about someone else but at the end of the day, I was writing it about me. I wrote it when there was a lot more unknown than there is now. I have a three year-old and my wife is pregnant with another one on the way that’s due July 25 and we’re on the road. Everything is happening at once. Back in the day when you’re figuring it all out and hoping to make something for yourself, it’s harder to visualize your future and what you want to do and the man you want to be and execute accordingly. It’s a frustrating place to be and it’s an exciting place to be. I wrote that song to convince myself that it’s worth it to keep on going because a lot of times I feel like it’s hopeless. There’s been a rotating cast of musicians. What’s the key to making that work? A lot of that is just the willingness of those guys and girls to be involved. We had our buddy James McAlister play drum and percussion and Matt Slocum from Sixpence None the Richer played strings on the title track, for free just because he liked it. Aimee Mann sang and were shocked and honored that she said yes. We certainly asked a lot more people. We had a decent amount of folks contribute and it’s great to get somebody else’s take on a song and bring a different set of ears to the table. I think having Aimee Mann sing on the title track was the icing on the cake or the cherry on top. We had mixed and mastered the whole record and then she said yes and her saying yes made us think it was going to be great and was going to be worth it.